In case anyone hasn’t noticed this, there are a few people who regularly come and go through the bins in the back lanes – a man and a young lad and a woman who is mostly on her own. I’m not sure what (if anything) can be done about this – any ideas? – but thought I should flag this up and two related points – confidentiality and mess. All my rubbish is genuine rubbish, and I shred anything with confidential or personal information, however would urge everyone to please be extra-vigilant in making sure that no personal details make it into your bin. At the Pollokshields Area Committee, on which Kevin Kane and I take turns to represent the Strathbungo Society, litter and rubbish are regularly discussed. There has been a real push by councillors and other committee members to make improvements in the local area, both by reducing the amount of litter being dropped and improving services. As a result of these discussions, a number of suggestions have been made for litter bins, including one from us – supported by Councillors – for a litter bin on the Darnley Rd side of the pedestrian footbridge over the railway. This was installed a couple of weeks ago and we hope it will reduce the amount of rubbish thrown onto the railway embankment. If there are any other places you think would benefit from a bin do let us know. We have also been in dialogue with Land and Environment Services about how we could improve the bulk collection service. At present it can take three weeks for such rubbish to be collected by which time the weather, vandalism etc can have scattered the rubbish all over the back lanes. 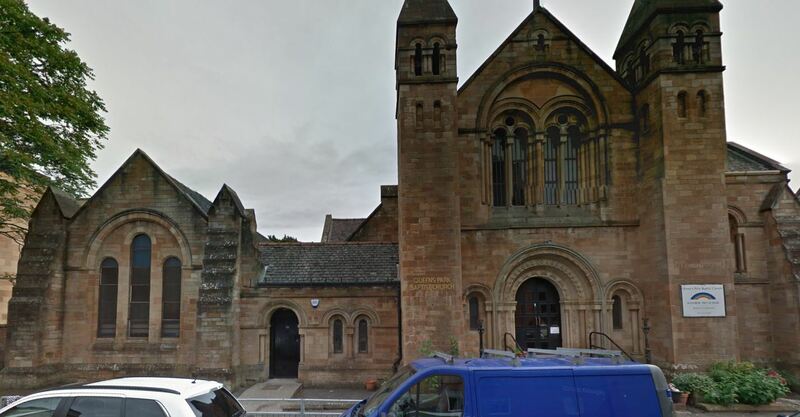 After a suggestion made at one of the Strathbungo meetings we asked whether it would not be better for the Council to collect on a fixed day each month, so that people would not have to put out rubbish without knowing when it would be picked up. The Council actually operates such a system with a number of housing associations but has fixed pick up points. The local officials, who have been very helpful, have said that if we could agree fixed pick up points they would make recommendations to senior managers to try this out (the position is complicated because the current system has been decided by the Council as a whole and local areas do not have the discretion to adopt alternative systems). After discussion at the Committee meeting this week, it was felt the problem with fixed pick-up points is first there is no vacant public space, so it would mean people volunteering to use their property in the back lanes for this purpose )(which we thought would be hard to obtain, and second that some bulk pieces of rubbish would be hard to carry to pick-up points. We therefore agreed to go back to the Council and ask them to look at other alternatives, including whether it would be possible to have a fixed pick up day each month but instead of the Council trawling all the lanes, they would just pick up from places notified to them by residents beforehand. Under such a system, if the pick up day was the last day of the month and you had bulk rubbish, you could put it out the day before and ring the council with details of where to pick up the rubbish. Whether the Council will be open to trying this out we are not sure but meantime if you have any views or other ideas on how to reduce the amount of litter please let us know by commenting on this. 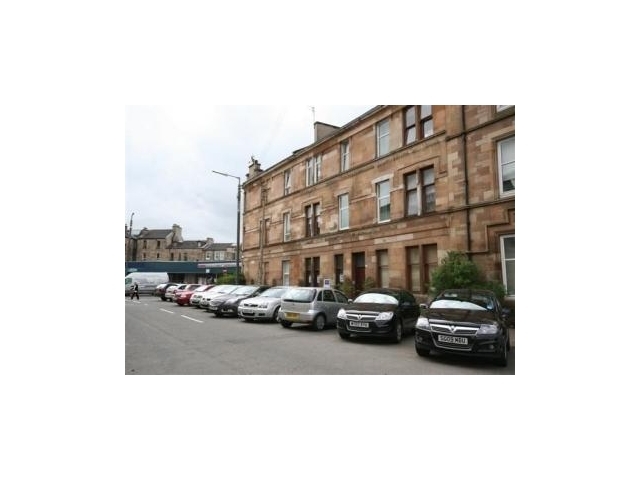 In mid-August pavements on Nithsdale Street and Road were resurfaced with black tarmac. This was done to a very poor standard and seems to have no account of the Council’s policies for Conservation Areas. 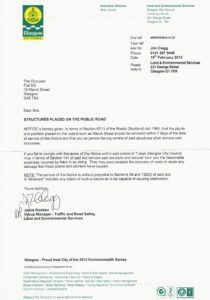 As a result the Strathbungo Society Committee wrote to the Council to express our concerns, state that we thought this was a lost opportunity to improve the local streetscape and to ask for a way forward (the letter is pasted below). The Council has now agreed to a site meeting on Thursday 25th September to look at the standard of the work undertaken and discuss the issues that we have raised. We will post an update following this meeting. Does anyone know who owns the Siamese cat that seems to live in the back lane between Queen and Marywood Square? Seems to be mainly around the 30s and 40s of the streets. Description below. The cat seems to be out at all hours and all weathers, and I just wondered if it is in fact owned, or if it’s a stray. I’d love to hear from the owner, or anyone who might know them. Description: the Siamese is a fairly large, but quite skinny cat with soft brown head, vivid pale blue eyes and a very light cream front that shades to soft brown at its back, with soft brown legs and tail. It is a bit wary of people but not really shy. You may have noticed the increased presence, and persistence, of the bin rakers of late. In my case, I am fed up of rebagging my rubbish every fortnight before the binmen come, especially when it gets ripped open again during the night. However things reached a nadir last week when I left an electrical cable running out under my garage door for the use of a builder working in the back lane. The rakers cut the cable at both ends and made off with 20m of electrical cable, value probably little more than 50p. In doing so they pulled as much cable under the door as they could, ripping the electrical socket off the wall and leaving mains cabling dangling dangerously in my garage, and cost the builder £20 – it was his cable. It is time to fight back, albeit legally. I have spoken to the police at Gorbals Police Station (in particular PC Ali Martin) who are aware of the problem, and are keen to identify the culprits. While they are planning plain clothes patrols in the lanes in the next few weeks, we can also help. We need to do more than just move them along, and if you do not wish to intervene, call the police on 101 (the new non emergency number, not 999) immediately. If they have someone free they will come round and try to catch them in the act. If you feel more proactive, the issue is one of identification; this is best achieved by two collaborating witnesses, and photographic evidence to identify the individual. I almost got a photo of the protagonists last week and regret not doing so. While I have sympathy for those less fortunate than ourselves, it stops when they begin causing criminal damage, and this needs to be nipped in the bud. Happy snapping, but of course, no taking the law into your own hands. It just isn’t the Bungo way. 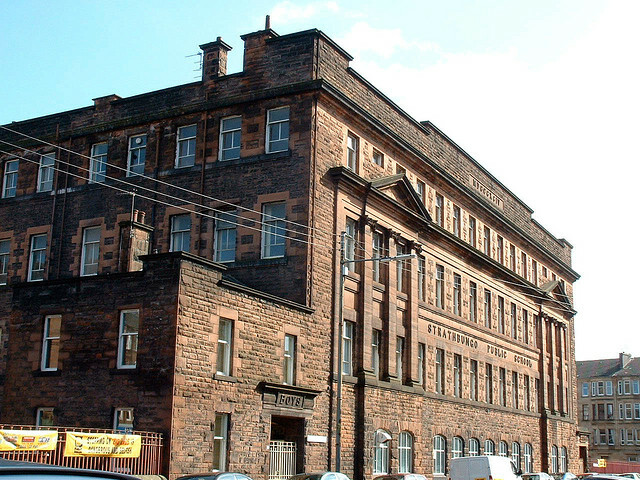 What do you think the Council could do to most improve Strathbungo – planning enforcement? Better street-cleaning? Fixing broken street furniture and hard landscaping? Sorting out dog fouling? Well, they could do all of the above but this week residents on March St were informed that what the Council thinks would really improve Strathbungo would be…removing all the lovely planters which have brightened up the front of their flats for well over a decade. The lovingly-tended plants have been mentioned several times in the Newsletter, at meetings and just in general chit-chat as being a real highlight of the Strathbungo Summer and are a great example of what residents can do for themselves to make our environment cleaner and greener, something the new citizenship handbook states is a duty for everyone living in Britain. I’ve already contacted our city councillors to ask if they can help us reverse this barmy decision and would love to pass on the comments of other residents who appreciate this and other attempts to create an oasis in our sandstone desert! I’m also on the look out for pictures of the plants in full bloom as this pic does not do them justice. They look great on streetview but I can’t find any good pics in our archive, so if you have some please do post! I had hoped to set up a petition but, under the Council’s recently changed rules on public petitions, can not do so before the deadline in the letter as it needs to be approved by a meeting of the Community Council. 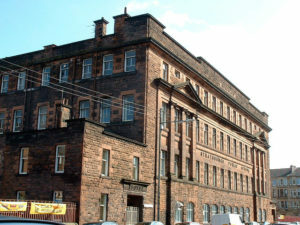 Glasgow City Council is planning to close St Bride’s Primary School’s pool, in the basement of the listed building. Four such pools are earmarked for closure, putting pressure on an already limited resource, especially in the Southside. Many community groups and local schools, not just St Bride’s, use this valuable community facility to teach primary school pupils to swim and a decision on the closure is expected to be made on 7th February. Write to your councillors by post or by email, asking them to help save the pool at St Bride’s. Go to your local councillor’s surgeriess and let them know you want to help save the pool. Join us from 12 noon on 7-2-13 outside the City Chambers before the full council votes on the budget. 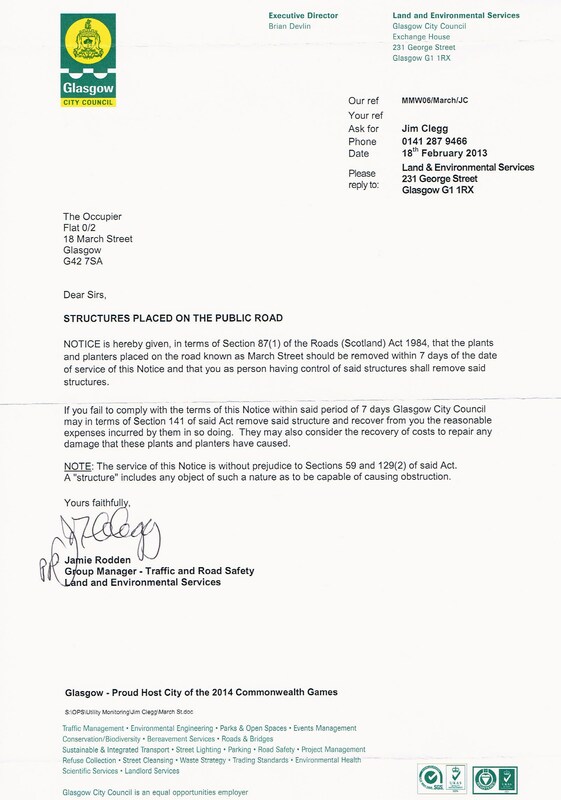 Perhaps members of the society are already aware of this and have passed it on, but it seems that we will be saddled with the charming building works at the east end of Nithsdale Road for another month. As a reward for their consideration in our neighbourhood, the aptly named Forkers have been offered the contract to carry out the repair work to the lanes, requiring continued use of their infernally bleeping diggers seven days a week. If it is possible to salvage a silver lining from this situation, it is that Forkers will have to clean the windows in Nithsdale Road once they’ve finished (I’m guessing that this only applies to the outside and that the dust that has forced its way onto inner sills and into closes will revert to our jurisdiction) and those who would like to have their cars washed should make themselves known to the site manager, Willie, for him to arrange it.